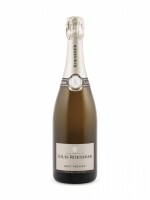 One of the top brut Champagnes constently available to Canadians, Roederer Brut Premier is a rich and refined sparkling wine with impeccable balance. The style is strongly influenced by some old oak maturation and bottle aging for three years to contribute nutty and toasted notes that are nicely counted by refreshingly tart lemon/lime flavours, which make the flavours really pop. Highly recommended.